"It" being the sealed copy of Game & Watch Collection I mentioned last week. 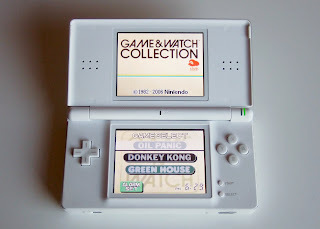 I spent a few minutes playing each of the games included on this Club Nintendo-exclusive title yesterday, and although I enjoyed them (Donkey Kong especially) I doubt the cartridge will spend much time in my DS. Oh, well, at least it was free. I lovei t. How'd you nab it, again? It was a Club Nintendo "reward," Justin. I think I had to spend 800 of my 1100 (or so) Club Nintendo points to get it. You're a member of Club Nintendo, right? If not, you should be! You get points for registering systems and games -- and then you can use those points to get prizes/rewards (like the Game & Watch Collection). I'm NOT! I didn't really even know about that.